So yeah, Zack Greinke is amazing and yeah, Adrian Gonzalez keeps on rockin’ and yeah, Dee Gordon is greased lightnin’. So who is quietly – that’s right, quietly, off the radar, with little fanfare or media attention – one of the Dodgers’ top contributors in 2014. 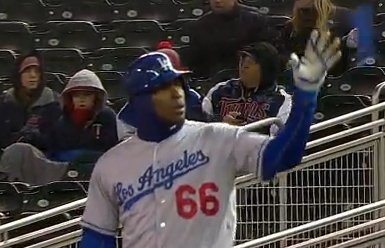 Some guy named Yasiel Puig. According to Fangraphs, Puig was the 2014 Dodgers’ fourth most valuable position player entering play tonight, trailing Gordon, Juan Uribe and Gonzalez. He was also neck-and-neck-and-neck with Ryan Braun and Jason Heyward for third place among National League right fielders. And that was before Puig went 2 for 4 in the Dodgers’ 6-4 victory over Minnesota, raising his on-base percentage to .364 and slugging percentage to .471. But you wouldn’t know it, given that almost all the discussion about Puig this year has been about his shortcomings and other off-the-field stories. Admittedly, with three home runs in 27 games, it doesn’t really feel like Puig has unleashed the power the way he did upon his arrival in 2013. On the other hand, we keep hearing about pitchers are adjusting to Puig, and he hasn’t exactly fallen apart. Far from it. Tonight was Puig’s 190th game on American soil, including Double-A, Single-A and the Dodgers’ Arizona Rookie League team. That’s it. It’s still reasonable to say the guy is just getting started, and his career Major League OPS remains above .900. With Clayton Kershaw passing his latest test, Greinke extending his authoritative pitching with a six-inning, one-run (unearned) outing, the offense amassing 16 baserunners and the franchise recording its 10,000th NL victory, it was a good night. Even if the bottom of the ninth was an adventure. Dodgers at Twins, 5:10 p.m.
Two changes come to the active roster in time for today’s game against Minnesota. Lefty reliever Paco Rodriguez and catcher Miguel Olivo have come up from Albuquerque, while infielder Carlos Triunfel and catcher Tim Federowicz make the journey to Triple A. Among players who have primarily been catchers in their careers, Olivo ranks 32nd all-time with 145 home runs. Ahead of him are eight former Dodgers: Mike Piazza (1), Gary Carter (6), Roy Campanella (10), Todd Hundley (13), Ernie Lombardi (17), Ramon Hernandez (23), Charles Johnson (24) and Mike Lieberthal (31). Chad Billingsley, meanwhile, has been moved to the 60-day disabled list, which would still allow him to be activated in May. Billingsley, who made a rehab start April 6, received a platelet-rich plasma injection on Tuesday for elbow tendinitis last week. The Dodgers can also add a 26th man to the roster for Thursday’s doubleheader, based on a Collective Bargaining Agreement rule that allows clubs a 26-man roster for day-night doubleheaders if scheduled at least 48 hours in advance. More roster changes could be coming in the next few days, based on a) what happens with Clayton Kershaw’s rehab start with Double-A Chattanooga tonight and b) the potential need for a starting pitcher Sunday, so that Zack Greinke doesn’t have to come back on three days’ rest. The Dodgers can expect to face a lefty in Minnesota after all. For their 26th man on Thursday, the Twins have called up Kris Johnson (not the former UCLA hoopster) to make his first Major League start. Johnson pitched 10 1/3 innings in relief for the Pirates last year with a 6.10 ERA but 2.76 FIP. He has a 2.86 in 22 minor-league innings this year, with 20 strikeouts against 26 baserunners. Carl Crawford makes his first start in the No. 9 slot of the batting order since September 20, 2003. Adrian Gonzalez has been the top first baseman in the Majors in April, according to Jay Jaffe of SI.com. Dee Gordon was honorably mentioned at second base. 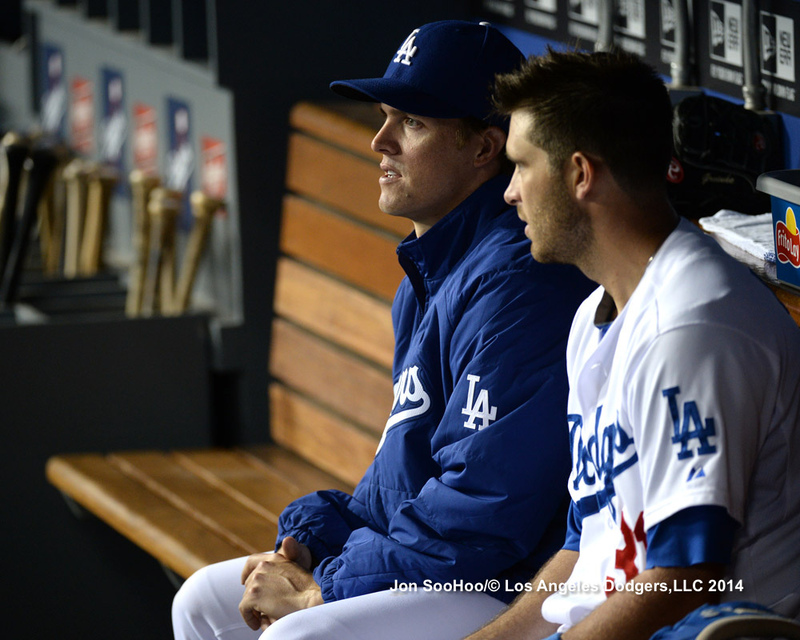 Greinke’s performance to date is analyzed by Dustin Nosler at Dodgers Digest. Maury Wills is featured in the final posting from the great series of Union Oil 1961 Family Booklets, presented by Ernest Reyes at Blue Heaven. Nine years ago before this three-game series against the Twins, the Dodgers hosted Minnesota in a weekend set that became the Hee Seop Choi show. The first baseman homered in six of his 12 at-bats against Twins pitching: two (including a bottom-of-the-ninth walkoff) on June 10, one on June 11 and then a hat trick on June 12. Though he was a polarizing player from practically the moment he came to Los Angeles in the summer of 2004, chants of “Hee! Seop! Choi!” reverberated around Dodger Stadium. Choi finished his brief Dodger career with 15 homers in 382 at-bats and a .747 OPS. He eventually worked his way back to his native South Korea. Here are just a few consequences of the Dodgers’ game at Minnesota today being postponed because of weather. Two days’ rest for everyone — and that’s assuming they can get a game in Wednesday, for which the forecast is only slightly improved. 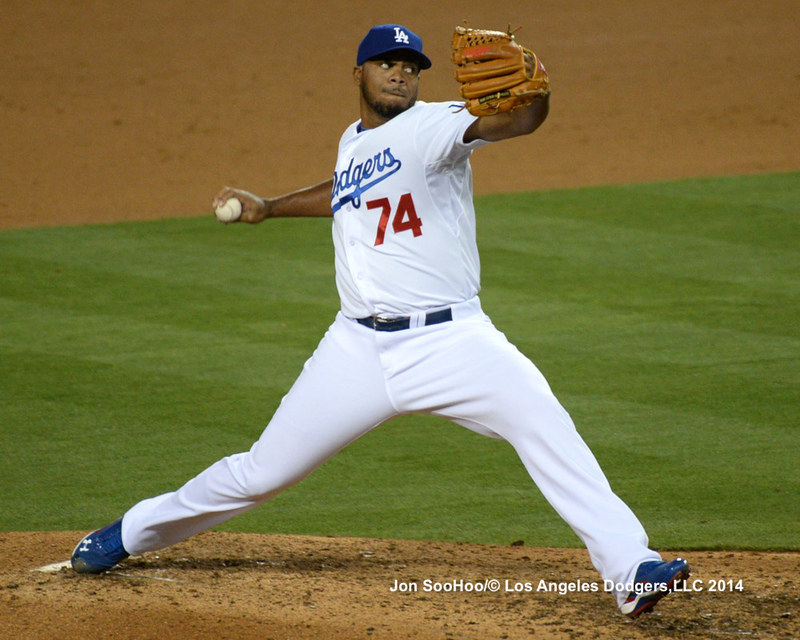 For you Kenley Jansen watchers, that means that the next time he takes the mound, he’ll have thrown only 18 pitches in at least a week. And Hanley Ramirez’s thumb contusion gets an extra day of healing. Conversely, there is some potential double duty for the bullpen Thursday, when the Dodgers are now scheduled to play a split doubleheader with games at 10:10 a.m. and 4:10 p.m. Pacific. A strong outing Wednesday by Zack Greinke would help mitigate that burden. And, the team will be that much more tired when they arrive in Miami for the weekend series against the Marlins. Other than that, I guess the team has some time to sit back and watch TV. A new episode of “Fargo” is on tonight — that seems weather-appropriate. Oh, the weather outside might be frightful, and interleague play isn’t always delightful, but here are a couple of reasons to look forward to the Dodgers’ trip to Minnesota. For one thing, the Dodgers put their AL misery behind them last year, going 12-8, including a 5-5 mark on the road. For another, the designated hitter allows the Dodgers, if they so choose, to put aside the “Who’s playing in the outfield?” questions for a few days. Los Angeles is scheduled to face three consecutive right-handers in Kyle Gibson, Mike Pelfrey and recent old friend Ricky Nolasco, who is off to a slow start with a 6.67 ERA in five games, with 52 baserunners against 13 strikeouts. So expect Carl Crawford, Andre Ethier, Matt Kemp and Yasiel Puig to all receive considerable playing time, with Scott Van Slyke a power bat off the bench to pounce on any left-handed relievers. 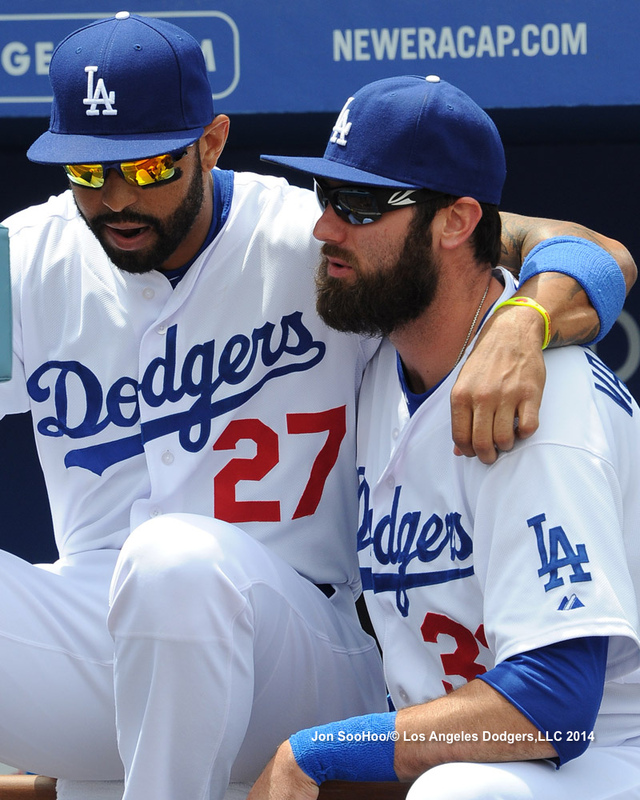 As a team, the Dodgers have a .769 OPS against righties in 2014, compared with .592 against lefties. Scheduled to pitch for the Dodgers are Zack Greinke, Dan Haren and Josh Beckett. The Dodgers announced that Clayton Kershaw will next pitch a rehab game Wednesday for Double-A Chattanooga against Tennessee. 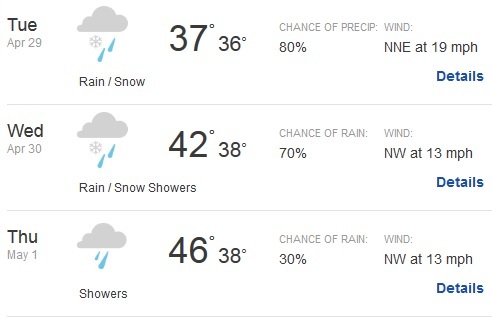 Maybe the Dodgers will see a lot of May flowers in Miami, because it looks like they’re headed for a last (cold) gasp of April showers for their three-game series in Minnesota beginning Tuesday. Why, it might be even more inclement there than it was at Dodger Stadium on Friday. Let the record show that Don Mattingly threw left in the Major Leagues. 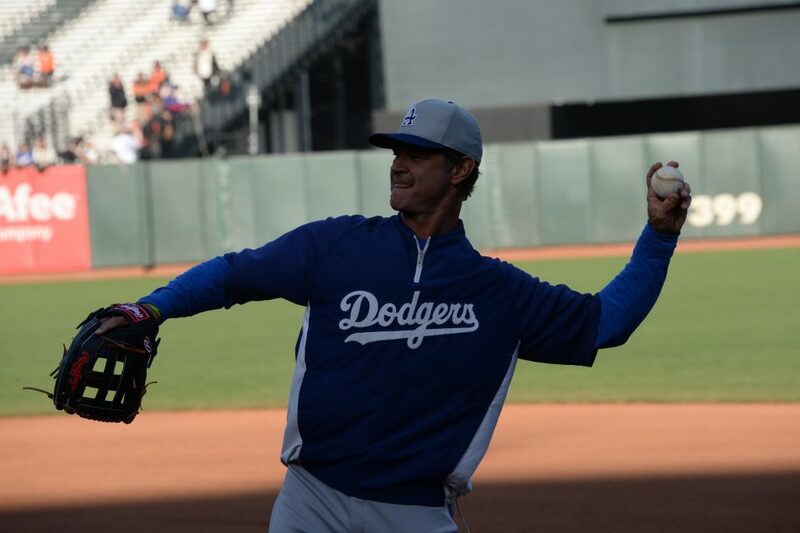 Let the picture show that Mattingly throws right. 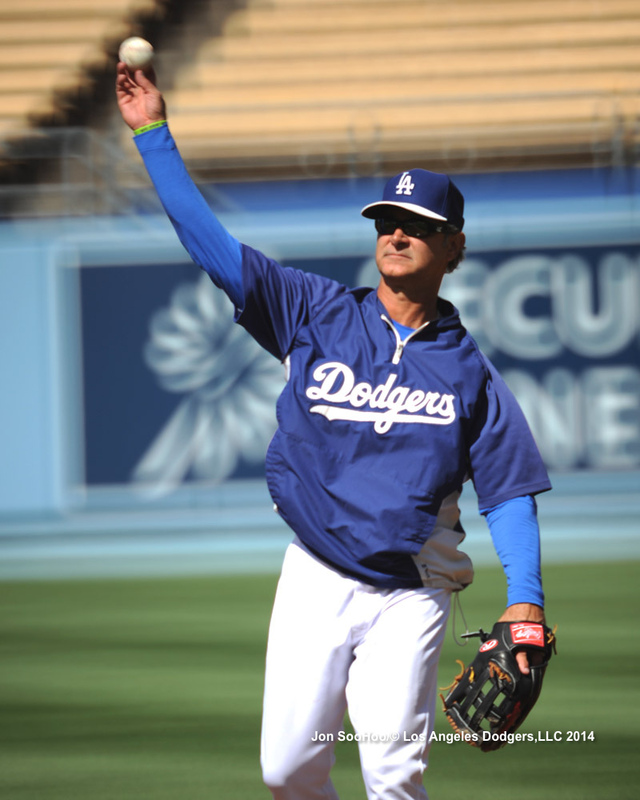 Mattingly explained that he’s ambidextrous, but after spending his career throwing left — including three games at third base in 1986 — wear and tear has turned him around. Mattingly said that in Little League, when he played positions including catcher and shortstop, he played right-handed. When Chris Withrow walked three batters and a veritable tightrope in the eighth inning of the Dodgers’ 6-2 victory over Colorado on Saturday before escaping with strikeouts of Carlos Gonzalez and Troy Tulowitzki, it was part of a surprising trend. Dodger relievers have walked eight more batters than Dodger starters this season, in 57 fewer innings (4.7 walks per nine innings). Withrow has struck out 18 and allowed only two hits in his 12 1/3 innings this season, but he has walked 10. Having the most trouble is Brian Wilson, who has walked six batters and hit two others in his four innings (along with eight hits allowed). The relievers obviously aren’t trying to walk people, but as soon as they can reduce the free passes, the more streamlined innings should help ease the collective bullpen workload. Carlos Triunfel, whom the Dodgers claimed on waivers from Seattle on April 2, has been called up as a reserve infielder. Hanley Ramirez, who has a right thumb bruise, had a scheduled day off today and isn’t expected to go on the disabled list, but the Dodgers wanted some more infield depth. Jose Dominguez has been sent back to Albuquerque. 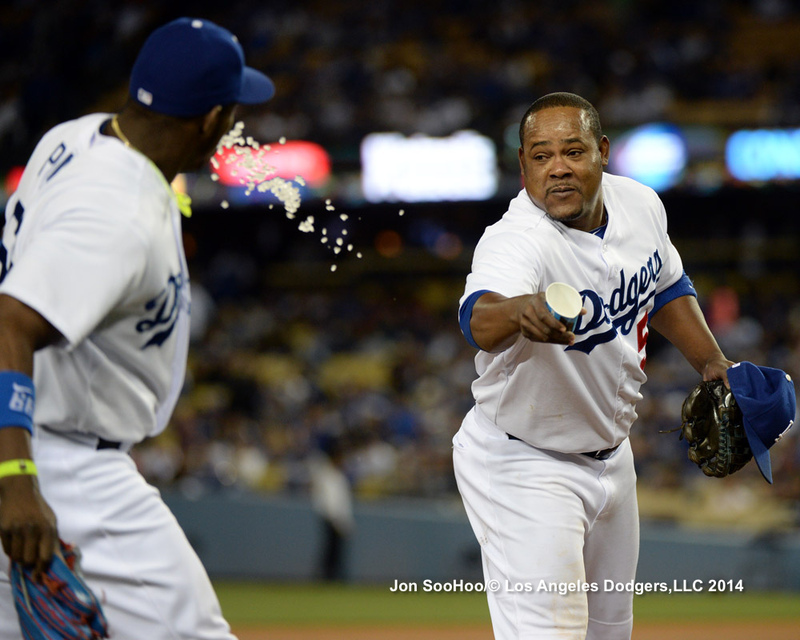 Friday’s assortment of Jon SooHoo photos is a good one — check ’em out here. Rockies at Dodgers, 6:10 p.m. 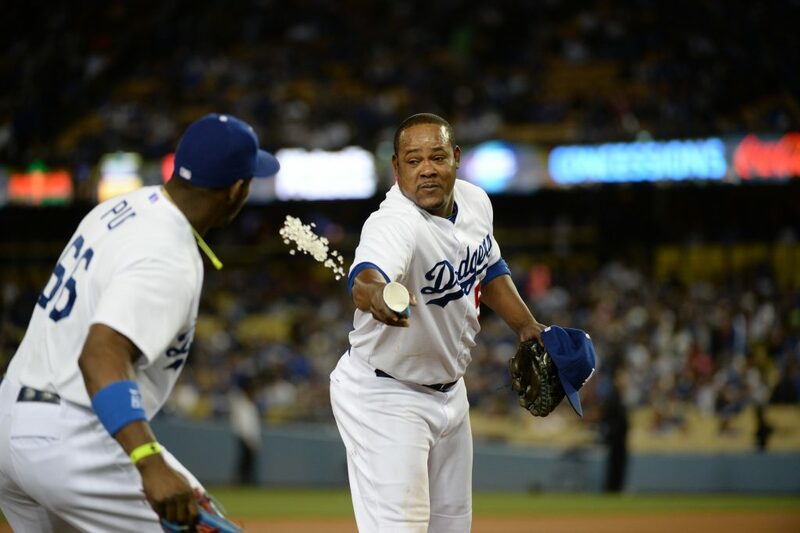 Note: Juan Uribe gets a rest from the starting lineup for the first time this season. Going into play on August 7, 2009, the Dodgers had a 6 1/2-game lead in the National League West. They played five extra-inning games over the next 18 days, and here’s what happened. August 7: Chad Billingsley left after six innings with a 5-2 lead at home against Atlanta. The Dodgers allowed two runs in the seventh, one in the ninth and a whopping four in the 12th, capped by a three-run home run by Ryan Church off Scott Elbert. August 8: The very next night, the Dodgers and Braves played scoreless ball heading into the 10th inning. (Clayton Kershaw pitched the first seven innings for Los Angeles, striking out 10), when Kelly Johnson hit a two-run homer off Guillermo Mota. The Dodgers came back with a two-out RBI double from Andre Ethier, ending a 16-inning scoreless streak for the team, but after an intentional walk to Manny Ramirez, Matt Kemp grounded out. August 12: The only game I’ve attended at AT&T Park. Tim Lincecum was one strike away from a 2-1, complete-game victory for San Francisco when Ethier singled home Rafael Furcal to tie the game, but Mota gave up another game-winning, 10th-inning, two-run home run. The man who hit that blast? You might recognize him. 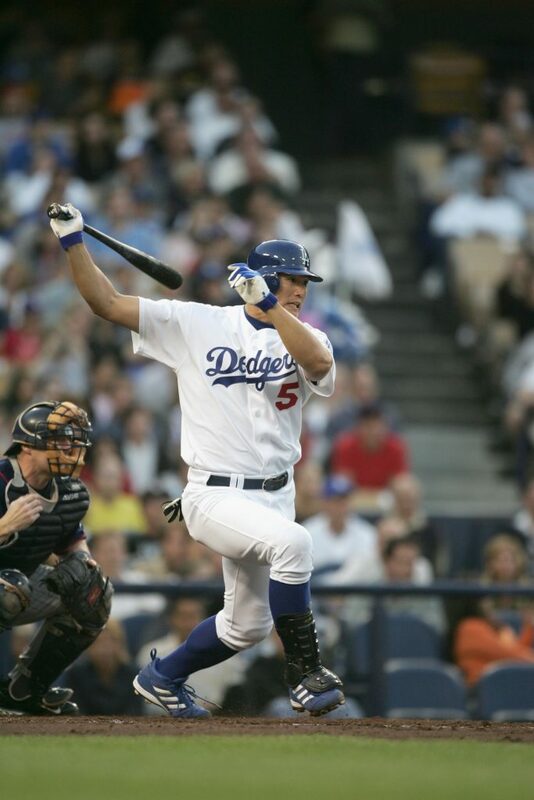 August 15: With the Dodgers leading Arizona, 3-1, in the bottom of the ninth, Jonathan Broxton allowed back-to-back home runs by Mark Reynolds and Miguel Montero. Ramon Troncoso then gave up a game-winning hit in the bottom of the 10th. August 25: For the second time in their past three extra-inning games, the Dodgers rallied to tie in the ninth inning, this time on a Matt Kemp sacrifice fly and a Manny Ramirez RBI single. Troy Tulowitzki’s RBI single off James McDonald in the bottom of the 10th won it for Colorado. The offense and bullpen weren’t doing great, and they certainly weren’t in sync. The Dodgers’ NL West lead was reduced to two games. It was unpleasant. It wasn’t the end of the world. Los Angeles nipped its extra-inning woes with a 3-2 victory over Cincinnati on August 30 (Kemp game-winning RBI, McDonald the win, Broxton the save), part of a 19-10 run that helped them eventually clinch the division. 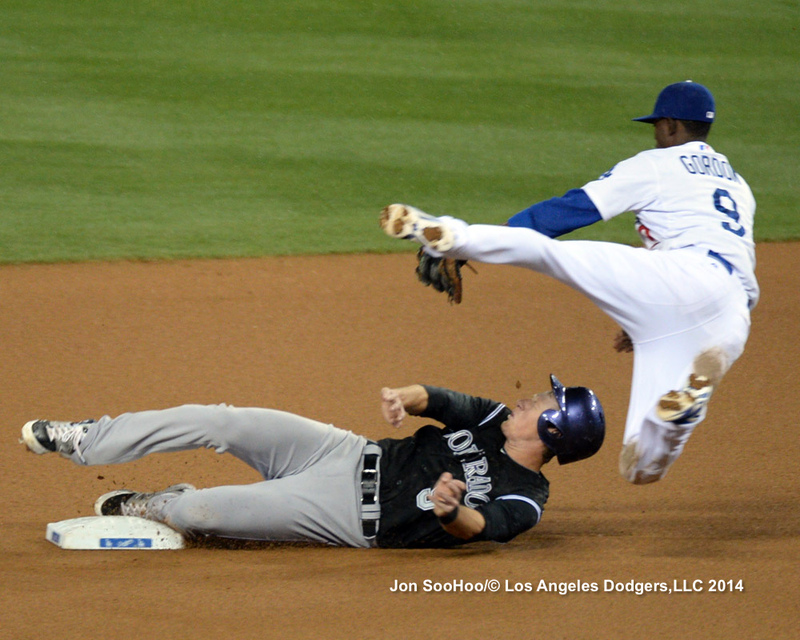 Despite the streak, the Dodgers, in fact, were 12-9 in extra-inning games in 2009. In general, rain is as welcome in Southern California as an eight-inning, two-run outing by Josh Beckett is welcome to the Dodgers. The combination of the two certainly made for strange bedfellows Friday, punctuated by the Dodgers setting a modern franchise record by playing their sixth extra-inning game of April (according to my research at Baseball-Reference.com). Tonight, it was the Dodgers who ended up all wet, falling 5-4 in 11 innings, despite a two-run homer in the bottom of the 11th by Adrian Gonzalez, his team-leading seventh of the year. In the past 17 days, Dodgers have lost their past five extra-inning games, their longest streak since they lost five overtime games in a similarly shocking short stretch, from August 7-25, 2009. Don’t blame Beckett. The righthander, coming back from season-ending injuries nearly a year ago, gave up two solo home runs in the second inning but allowed only two other baserunners, a fourth-inning single by Justin Morneau and an eighth-inning single by DJ LeMahieu. In between those last two hits, he retired 11 in a row, and when he got Charlie Blackmon to ground out to second to end the eighth inning, he had lowered his ERA to 2.45. This was Beckett’s longest outing since losing an 8 1/3-inning complete game on April 14, 2013 and the longest outing by a Dodger this year. And Beckett did it with only 99 pitches. In his past three starts, Beckett has gone 18 innings, allowing two runs (1.00 ERA) on seven hits and seven walks with 17 strikeouts. But what could have been a tidy, sub-3:00 victory instead extended to extra innings, with the Dodgers scoring two runs in regulation themselves — both driven home by Yasiel Puig. Puig hit a solo homer in the first inning, and then, after Dee Gordon’s remarkable infield double — yes, that’s right — Puig hit an RBI single in the third. It’s only April, and Dodger Stadium this year has seen rain, an earthquake and a giant sheet of ice (and just barely inside the time limit on this Friday Night Fireworks night, giant sparks of light shooting in the sky). What lies ahead, one can only wonder … although signs of an approaching Clayton Kershaw are getting brighter and brighter. Rockies at Dodgers, 7:10 p.m.
Well, it got a little cloudy today, but looks like no rain, which is a fine thing. After all, the Dodgers have important efforts in two parks tonight. There’s Clayton Kershaw’s rehabilitation start at Rancho Cucamonga, and the small matter of the Major League club trying to snap out of its Phillies phunk against the up-and-coming Colorado Rockies, who arrive in town only one game out of first place (with San Francisco in between both teams by a half-game). Tonight marks Crawford’s first start in a position lower than second in the batting order as a Dodger. 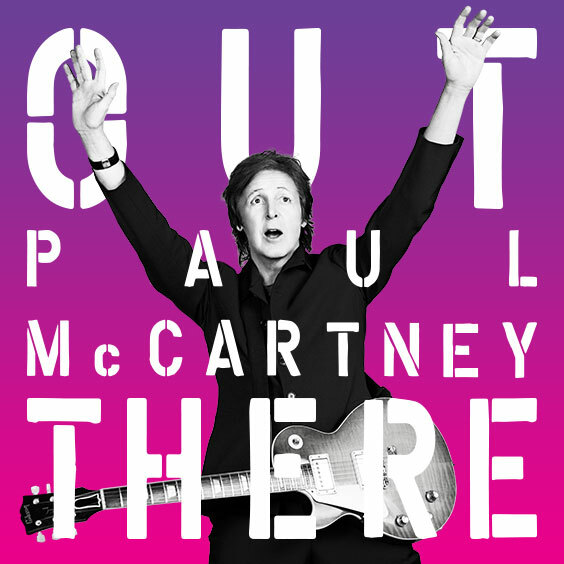 Paul McCartney will bring his “Out There” tour to Dodger Stadium for an August 10 concert. This will be McCartney’s first performance at Chavez Ravine since the Beatles’ penultimate live gig on August 28, 1966, and first in Los Angeles since two nights at the Hollywood Bowl in 2010. The tour features music from McCartney’s entire career, as a solo artist (including his most recent studio album “New”), member of Wings and as a Beatle. The set list will also include material from Paul’s most recent studio album NEW, a global hit upon its release last year. Tickets for the newly announced dates will be on sale May 5. American Express card members can purchase tickets before the general public beginning May 1. Check out paulmccartney.com or dodgers.com/mccartney. Phillies at Dodgers, 7:10 p.m. Speaking to reporters today, Don Mattingly addressed the chatter about the usage of Kenley Jansen, who leads the Majors in appearances, though it is mitigated by the fact that the Dodgers have spread their 23 games over 32 days. Mattingly said that the Dodgers are monitoring every pitcher’s workload, that it’s a day-by-day adjustment and that the extra-inning games and some shorter outings by some starting pitchers has had an impact. Going forward, you might see those factors reverse – there are fewer off days, but the starters are revving up for longer outings. There’s room for debate on how overworked Jansen is. 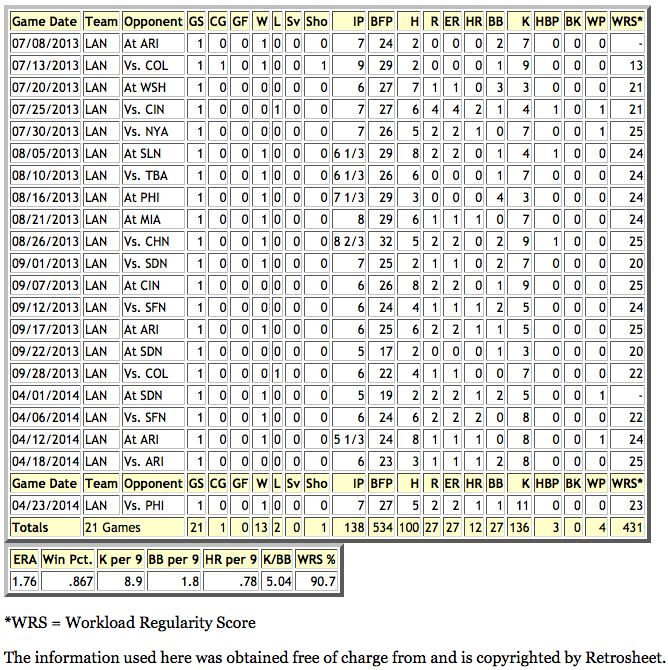 As you can see from his game logs (click the image below to enlarge), though he has all those appearances (and, as Mike Petriello points out at Dodgers Digest, hasn’t had consecutive days off since April 10-11), the most pitches he has thrown on consecutive days is 39, and he hasn’t worked three days in a row. Because he’s the closer, he’s also not someone who has had to warm up and sit down a lot — once he’s up, he almost always goes into the game. In the past eight days since he made 30 pitches in a game at San Francisco, Jansen has thrown 58 pitches, or 7.25 per day. Not incidentally, he’s been on his game. In his past four outings, he has faced 14 batters and allowed only two singles while striking out seven. Jansen’s K/9 this year is 16.6. This is your last weekend to bid on some one-of-a-kind items. 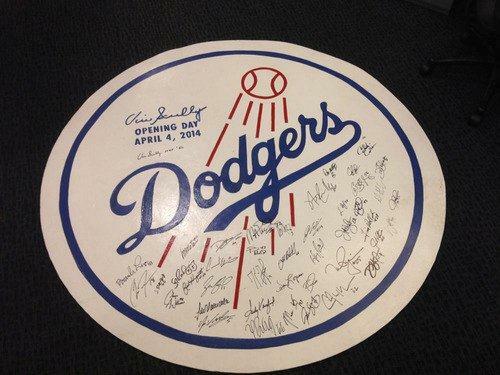 The First Pitch Mound used by Vin Scully on Opening Day comes signed by Scully, Sandy Koufax, Fernando Valenzuela and the 2014 Los Angeles Dodger roster. Also on bid from the home opener, NBA Hall of Famer and Dodger owner Magic Johnson’s autographed jersey, and a 2014 Jackie Robinson Day No. 42 jersey autographed by the team. Bid now at dodgers.com/auctions. Net proceeds benefit Dodgers RBI, a youth baseball program for boys and girls ages 5-18. A program of the Los Angeles Dodgers Foundation, Dodgers RBI offers 2,400 youth the opportunity to play ball. On April 11, 2013, Zack Greinke took a Carlos Quentin body blow that broke his collarbone. Greinke came back to work May 15 with 5 1/3 innings of one-run ball, but three starts later, his ERA was up to 4.80, and as late as July 3, it was 4.30. On Independence Day, Greinke apparently declared his freedom from the tyranny of Major League hitters. Greinke has set a modern record by making 17 consecutive starts of at least five innings with fewer than three runs allowed. Not only that, if it weren’t for a two-out, sixth-inning, Jay Bruce home run on July 25, Greinke’s streak would be up to 21 starts – essentially, two-thirds of a current Major League season. And though five innings has been set as the baseline for the streak, Greinke has actually thrown at least six innings in all but three of those games: September 22, April 1 and April 12. He left the September 22 game after five shutout innings on 72 pitches for some pre-postseason rest, and April 1 represented his first start of 2014 after a shortened Spring Training. So don’t let the five-inning minimum fool you. 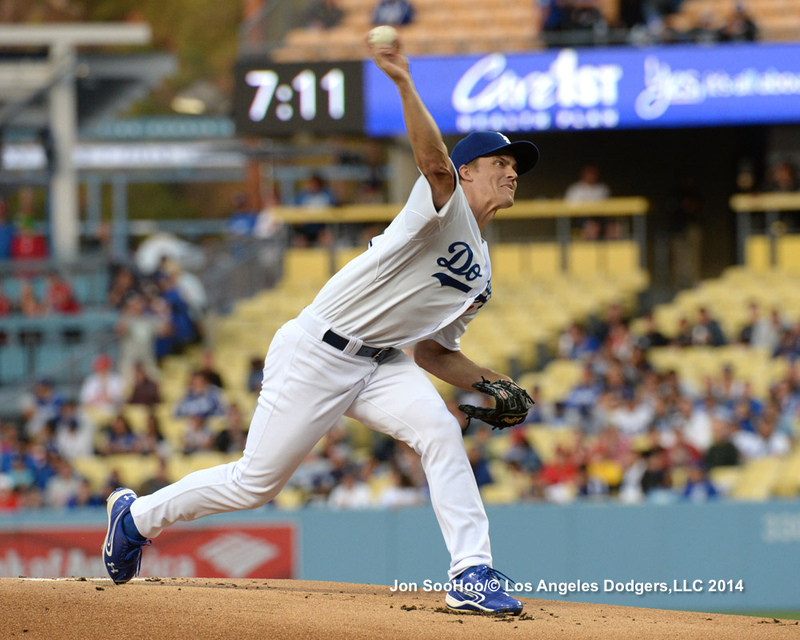 Since the fireworks went off last July 4, Greinke thrown 138 innings of a 1.76 ERA, averaging 6 2/3 innings per start with 8.9 strikeouts per nine innings against 8.5 baserunners, and five strikeouts for every walk. Yep, this is some streak.